This month, I have had some requests for some vegetarian Greek recipes. So I thought I would grab some aubergines and do some baking and stuffing with my own twist of course! 1) Wash and cut the aubergines in half lengthways. Scoop out the flesh (I used an ice cream scoop to do this) and put the flesh in a bowl. 2) Roughly chop the flesh of the aubergine into small chunks. 3) Heat some olive oil or sunflower oil in a large deep pan. Add the onions, the garlic and the flesh of the aubergine and cook on a low heat until soft. Once soft, add in the tinned tomatoes and stir on a low heat. 4) In a separate pan, bring water to the boil, and add in the rice, the peas and the sweetcorn. Once the rice is cooked, drain any excess water. 6) Place the aubergine shells in the oven at 180°C and cook for 40 to 45 minutes. 7) Add the cooked rice to the large pan of the aubergine stuffing tomato mixture and mix in well, sprinkling some oregano and chopped parsley. 8) Check that the aubergine shells in the oven are tender. If not leave for a little longer. Drain any of the excess stock then add the stuffing into each shell. If you have any leftover rice, maybe leave it for another day. 9) Sprinkle the cheese on the top of each aubergine shell and pop back in the oven for a further 20 minutes until the cheese has melted. 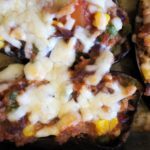 Simply delicious baked and stuffed aubergines! Wash and cut the aubergines in half lengthways. Scoop out the flesh (I used an ice cream scoop to do this) and put the flesh in a bowl. Roughly chop the flesh of the aubergine into small chunks. Heat some olive oil or sunflower oil in a large deep pan. Add the onions, the garlic and the flesh of the aubergine and cook on a low heat until soft. Once soft, add in the tinned tomatoes and stir on a low heat. In a separate pan, bring water to the boil, and add in the rice, the peas and the sweetcorn. Once the rice is cooked, drain any excess water. Place the aubergine shells in the oven at 180°C and cook for 40 to 45 minutes. Add the cooked rice to the large pan of the aubergine stuffing tomato mixture and mix in well, sprinkling some oregano and chopped parsley. Check that the aubergine shells in the oven are tender. If not leave for a little longer. Drain any of the excess stock then add the stuffing into each shell. If you have any leftover rice, maybe leave it for another day. Sprinkle the cheese on the top of each aubergine shell and pop back in the oven for a further 20 minutes until the cheese has melted. Have you pinned this recipe? Check out my pinterest!